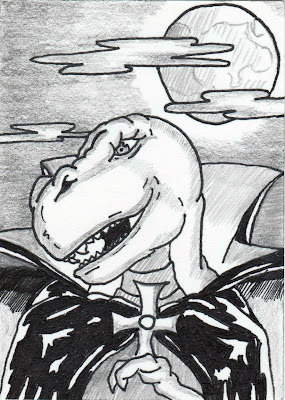 As an ode to one of my favorite websites on the internet, here's a portrait of the one and only Dinosaur Dracula! If you're a fan of the Halloween season like I am, head over to DinosaurDracula.com and check out the 2015 Halloween Countdown. It just started, so you can follow along until October 31! The head ghoul in charge, Matt, is a master of the macabre and always delivers a fantastic smorgasbord of content during the spookiest time of year. You won't regret it!